A police captain was shot dead, and a civilian volunteer injured while they tried to apprehend an armed drunk man in Chon Buri province yesterday evening (Feb 6). The officer was identified as Pol Capt Isarapong Kulchinda, an inspector at Nong Kham police station in Si Racha district of Chon Buri province. 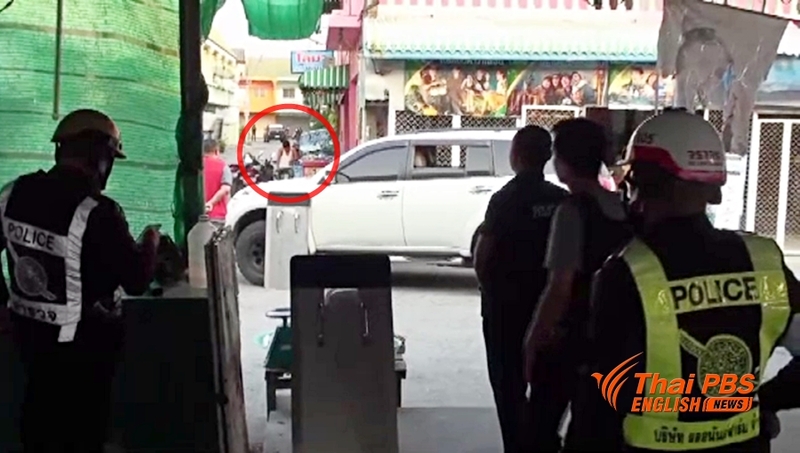 Pol Capt Isarspong and a police volunteer Supasit Monglieng rushed to a shop in Tambon Nong Kham at about 5 pm after being alerted of a drunk man with a gun in his hand was intimidating others in the shop. Both tried to calm down the man, later identified as Nirut Jitmun, 39, who was also appeared high on drug, and asked him to lay down his handgun. But he didn’t listen and shot at the two who tried to apprehend him. Pol Capt Isarapong was shot in the back while volunteer Supasit was shot in the abdomen. Both were admitted to Laem Chabang hospital where Pol Capt Isarapong was pronounced dead while Mr Supasit sustained serious injuries. Other policemen then surrounded the shop and later successfully convinced him to lay down his gun and surrender. Mr Nirut as later tested positive to methamphetamine. Chon Buri deputy police chief Pol Col Ronachai Jindamuk said police seized a .38 revolver, a 9mm pistol and some ammunition, and a small amount of ketamine from the suspect. Initially Mr Nirut faced murder charge for killing officer on duty, attempted murder for injuring a police volunteer, having guns in possession without licence, carrying guns in public place, and shooting in public place. Royal Thai Police spokesman Pol Col Krissana Pattanacharoen said police commissioner Chakthip Chaijinda has ordered immediate remedy for the killed officer’s family, and proposed promotion of the officer to major general to honour his sacrifice in performing duty. Under the remedial programme, his family will obtain 1.9 million baht in police welfare fund and pension. Besides, one of his children would be instated in the police force, the spokesman said.